There is no better place to spend Super Bowl Sunday, February 4, 2018, than in the hometown of Philadelphia Eagles’ defensive tackle and Yazoo City native Fletcher Cox! Fletcher Cox is the first Yazooan to play in the Super Bowl since Willie Brown. Brown became a member of the Pro Football Hall of Fame after he played for the Oakland Raiders for 12 years beginning in 1967. Watch Willie Brown’s legendary interception and 75-yard touchdown during Super Bowl XI on YouTube. Fletcher graduated from Yazoo City High School in 2009 and went on to play three seasons at Mississippi State University. The Philadelphia Eagles picked Cox 12th overall in the first round of the 2012 NFL Draft. At the end of his 4-year contract in 2016, the Eagles gave Fletcher Cox a 6-year, $103 million contract extension with $63 million guaranteed against injury, the most ever for a non-quarterback. 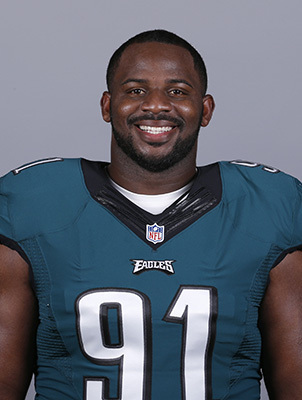 Among other awards and honors, Fletcher Cox received Second-Team All-Pro Honors in the 2014 and 2015 seasons, was selected to the Pro-Bowl in the 2015, 2016, and 2017 seasons, received the Ed Block Courage Award in 2015, and has twice been ranked by his peers on the NFL Top 100 Players (2016, 2017). For the first time in his career, Fletcher Cox will play in the Super Bowl on Sunday, February 4, 2018. Fletcher Cox has used his fame and fortune to benefit his hometown in many ways, including the notoriety just for being his hometown, which he is always proud to claim. He has held summer football camps, donated a trailer full of bicycles to a local drive for needy children in Yazoo City held in November 2017, and more. 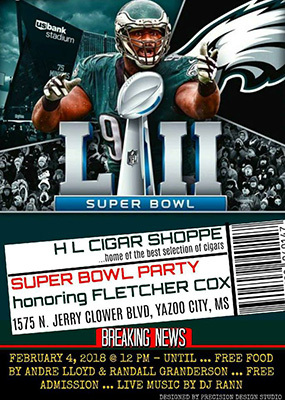 In honor of Fletcher Cox, a Yazoo hometown hero, the following businesses will be hosting Super Bowl watch parties and events. Please use the event or location’s contact information below for more details on each event. 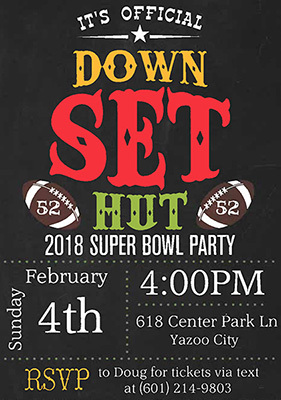 We hope to see you in Yazoo for Super Bowl 52! Visit H L Cigar Shoppe on Facebook for more info. Guests are welcome to bring a covered dish to share. Watch Super Bowl LII on the big screen with surround sound, Bar, and plenty of Pool Tables for a night of fun. 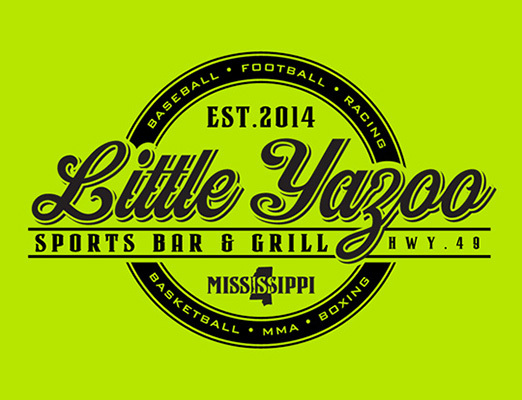 Visit Little Yazoo Sports Bar & Grill on Facebook for more information. Congratulations Fletcher and Yazoo City, my hometown!! Falcons fan but will root for my homie and the Eagles!! Get ready for the big parade in YC after the win. –Atlanta by way of YC. Go get ‘em Fletcher Cox!! So proud of you. GO Yazoo City, Will be going Philly all the way and so PROUD of 91 COX !! What a hard fought win for the Super Bowl WINNER! The Philadelphia Eagles! Couldn’t be more prouder of Fletcher Cox from our hometown of Yazoo City! Congratulations!!!! We are now looking forward to the big parade on Yazoo City,Mississippi honoring Fletcher!! Thelma Howard, Austin,Tx byway of Yazoo City,Mississippi born and raised!!! Thanks for your post, Thelma. We’ll be sure to keep you updated here on upcoming celebrations.